I wish to subscribe to the Deymed Diagnostic newsletter. 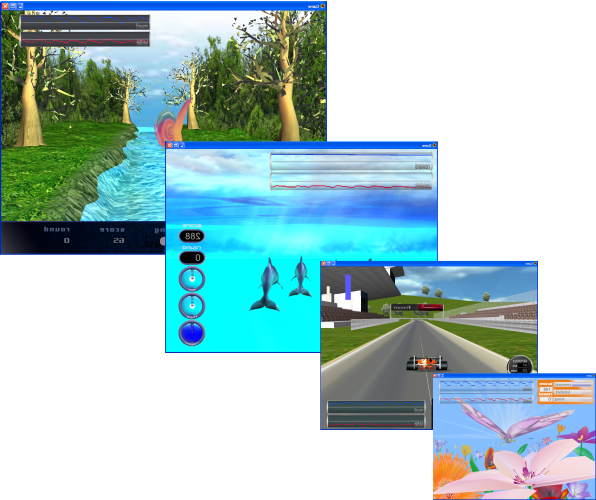 The most user-friendly interface of any neurofeedback system, the BrainFeedback 2 includes specialized neurofeedback 3D games, trend graph reports and an advanced protocol setup utility as well as new Z-Score training. 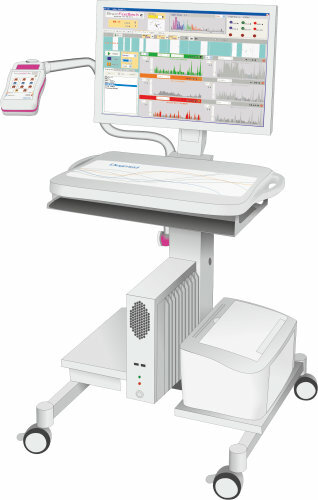 Battery Operated Offering the highest signal quality possible and lasting months on a single charge, Deymed systems significantly reduce artifacts and outside noise by running 100% on batteries. Optical Isolation Optical isolation greatly improves signal quality and patient safety. This feature combined with long-lasting battery operation, offers the best-in-class technology for neurophysiological recordings. High Sample Rates Designed with Digital Signal Processor technology, Deymed systems can sample at very high sample rates while changing any parameter on the fly digitally. DSP offers numerous advantages over standard analog processing. Click N' Go System Easily detach your system from the cart with a single click and be on-the-go with a laptop. You are no longer forced to choose between a hospital cart or a portable system. You can now have both in one. Always on Impedance Always-on impedance monitoring displays impedances during recording and has alerts to ensure electrodes are in-range at all times. 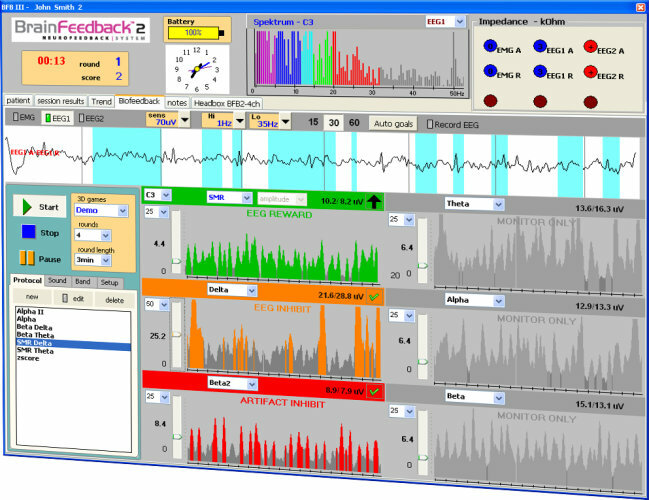 The values are saved to the EEG file for post quality-assurance review. 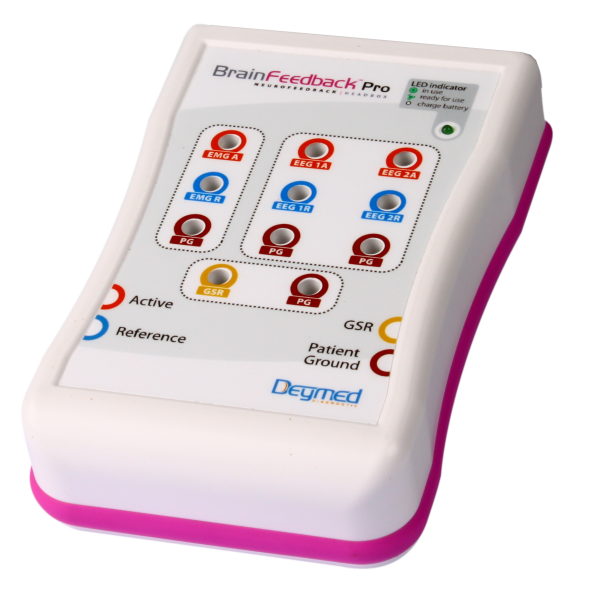 The Brainfeedback interface is designer to be easy to use, even for beginners. All controls are visible on one dashboard screen. This style layout stands in stark contrast to systems that require intensive study and training to create even basic protocols. The simple to use yet powerful dashboard layout allows a clinician to fully concentrate on the client's needs. 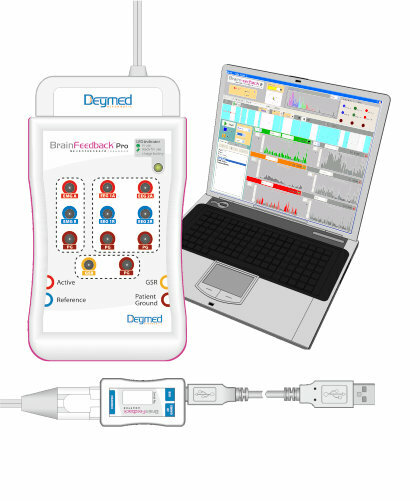 Deymed introduces the first DVD Neurofeedback system that has independant filters for up to three EEG and/or artifact bands as well as linear change to the filter effect as the patient gets nearer or farther from the set goal. 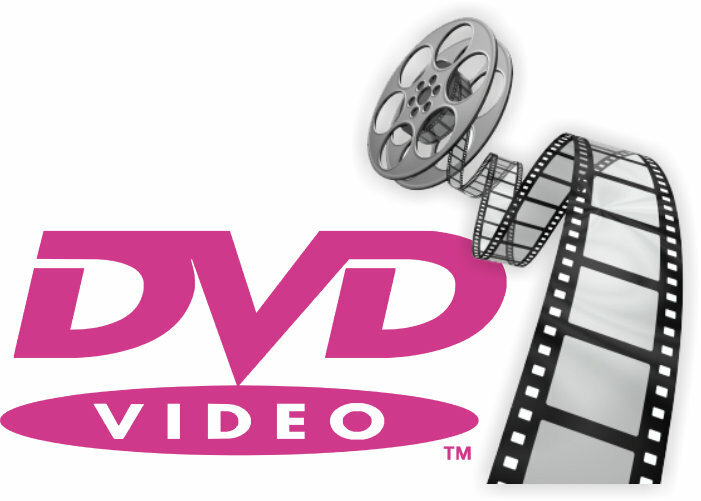 This new paradigm will dramaticly change how DVD is used in Neurofeedback. All patient data is saved automatically to a build-in patient database including scores, EEG data, power for each band, reward percentage, raions and Z-Score data. 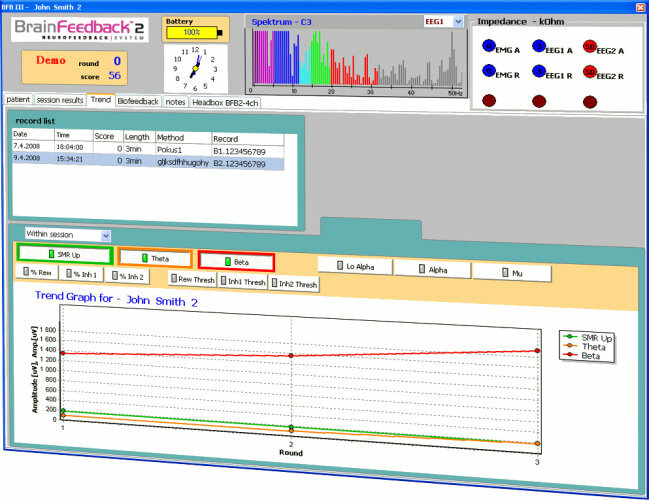 This infomation and more can be displayed at the push of a button in out trend graphing system designed in partnership with Dr. Joel Lubar, one of neurofeedback's leading pioneers. 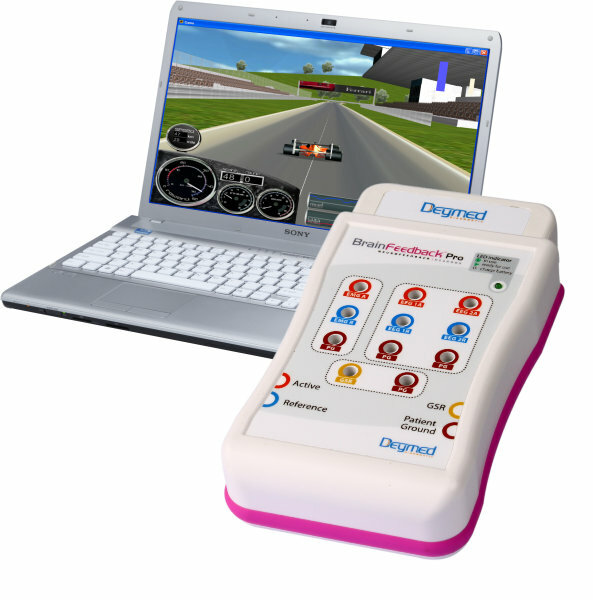 The most user-friendly interface of any neurofeedback system, the BrainFeedback Pro includes specialized 3D games, trend graph reports and an advanced protocol setup utility as well as Z-Score training. FlexiCart with integrated computer, Click N' Go System and 2 or 4ch BrainFeedback headbox connected to a USB adapter. Laptop with Click N' Go 2 or 4ch BrainFeedback headbox connected to a USB adapter. This product is not yet available for sale to clinical market in the United States and Canada. If you are interested in a research applications, please contact us. Download the 2018 Deymed Accessories Catalog in PDF format from the link on the right. You can also order any of the listed accessories directly from our ePortal via the web.